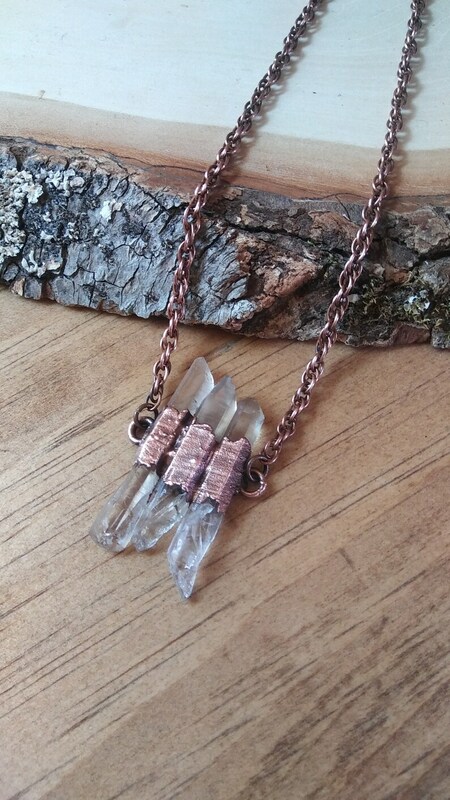 This listing features three Raw Lemurian Quartz that were attached together to make a unique pendant. I used a process called electroforming that takes over 24 to complete. the pendant measures 46x22x7mm and it hangs on a 16" copper chain. please note that the copper chain and pendant were sealed with protectaclear. for people who are allergic to metal. if you have any questions please send me a message and i will respond within 24 hours. Lemurian Quartz. ... An amazing healing crystal, Lemurian Quartz will assist in removing all types of energy blockages. Use a Lemurian Quartz Crystal for healing and meditation work. Also called “Lemurian Seed Crystals” or "Lemurian Star Seeds", Lemurian Quartz Crystals were originally found in Brazil.